Few teams mean more to a whole country than Zalgiris Kaunas does to Lithuania. In a country where basketball is like a religion, Zalgiris has been a reference for 70 years, before and after Lithuania regained independence in 1990. It has carried the country's flag in European club competitions as the team to beat from Lithuania. From its Euroleague finals appearances in the 1980s to winning the title in 1999 and its continuing high competitive level, it is simply impossible to understand Lithuanian and European elite basketball without Zalgiris, the flagship Euroleague team in a basketball-crazy country. This weekend, Zalgiris celebrates its 70th anniversary with a special tournament that features two hometown legends. 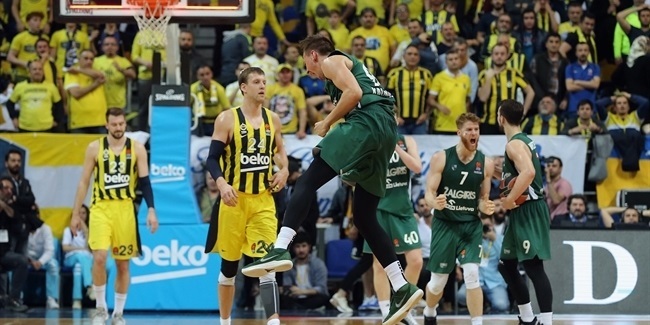 Recently retired Turkish Airlines Euroleague icon Sarunas Jasikevicius will debut as an assistant coach for Zalgiris against a team with whom he won one of his four continental titles, Panathinaikos Athens, on Saturday. Prior to that game, the biggest basketball institution in Lithuania, the great Arvydas Sabonis, will see his number 11 raised to the rafters and retired forever at Zalgirio Arena. "When I was growing up, it was a huge thing because of many reasons, first because Zalgiris was pretty much the only Lithuanian team that played in Europe," Jasikevicius recalled this week. "You would see teams like Barcelona, Madrid, Cibona, which was a big rival back then, come over to Kaunas. Zalgiris became a phenomenon in Lithuania. It is different now, there are good teams in Vilnius, Klaipeda and Siauliai which are really strong and have their own arenas. Back then, Zalgiris was almost like a national team, a matter of national pride." Zalgiris was founded in 1944 by the best players in Kaunas then: Stepas Butautas, Vytautas Kulakauskas, Justinas Lagunavicius, Kazimieras Petkevicius and Vincas Sercevicius. Within three years, they won their first Soviet Union title and added another in 1950. The team ranked second often, but had to wait three decades for another title despite having its own superstar in Modestas Paulauskas, who won seven international gold medals with the Soviet Union between 1965 to 1974. Everything changed when Sabonis pulled on the green jersey at age 16 in 1981. He joined forces with Rimas Kurtinaitis, Valdemaras Chomicius and Sergejus Jovaisa to make Zalgiris a superpower. Sabonis could do everything: pass like a playmaker, shoot like a guard and dominate the paint. Two years after it debut in European club competition, Zalgiris reached the 1985 Cup Winners' Cup final, but lost narrowly to FC Barcelona. That season, Zalgiris won the first of three consecutive Soviet Union League titles, downing CSKA in one of the best chapters in their classic rivalry. When Zalgiris made its Euroleague debut the next season, Sabonis was simply unstoppable. Zalgiris knocked off continental superpowers Olimpia Milano, Real Madrid and Maccabi Tel Aviv to reach the final against Cibona, led by Drazen Petrovic. Zalgiris trailed most of the way but reduced its deficit to 58-52 with 14 minutes left. Sabonis, who had 27 points, 14 rebounds and 3 blocks until then, was disqualified for punching Mihovil Nakic and Zalgiris never recovered. Zalgiris took revenge in the 1986 Intercontinental Cup, downing Cibona in the semifinals on the way to that title. Sabonis, Kurtinaitis and Chomicius would soon help the Soviet Union win the 1988 Olympic Games gold medal. Lithuanian basketball was on the rise and Zalgiris was its best and brightest icon. After independence in 1990, Zalgiris started to fill its trophy case non-stop, winning every Lithuanian League title from 1993 to 1999, and upsetting upset Olimpia Milano 82-67 in the 1998 Saporta Cup final as Saulius Stombergas scored 35 points in just 29 minutes. Anthony Bowie, Tyus Edney and Jiri Zidek arrived the following season as Zalgiris took aim at the Euroleague again. 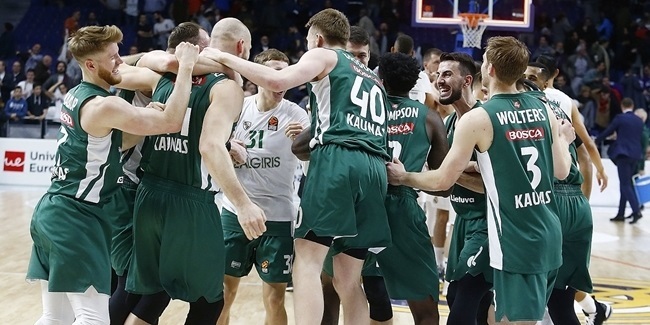 Zalgiris played fun-to-watch, attractive basketball, suprising everyone as it advanced to the final against defending champion Kinder Bologna. Zalgiris played a perfect game to win 82-74 behind 17 points from Bowie and 14 from Final Four MVP Edney. A national dream in Lithuania had come true: Zalgiris was the continental champion! 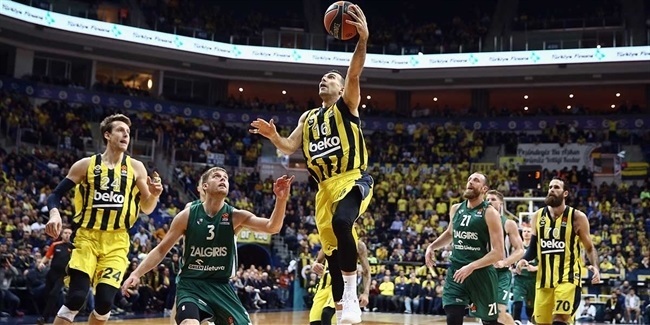 Five years later, Zalgiris had one foot in the 2004 Final Four before a miracle last-second shot by Maccabi prevented Sabonis, the 2003-04 Euroleague MVP at age 39, from fighting again for Euroleague glory. Zalgiris has continued to win Lithuanian League titles, 16 in all, as some of Lithuania's best players - Jasikevicius, Robertas Javtokas, Paulius Jankunas, Darjus and Ksistof Lavrinovic, Kalnietis, Jonas Maciulis and Dainius Salenga, to name a few - have donned its jersey with pride. "It is truly special, it is being part of the history of our team. Zalgiris is the best club in Lithuania and one of the historical clubs in Europe, so Zalgiris turning 70 is a big thing for all of us who love this club," team captain Paulius Jankunas told us. "You feel part of one of the most important teams in Europe."